Frey & Sons has been in business since 1963 when Elias, Robert, Roger (aka Butch) and Ron Frey founded the company. Robert’s sons Mark and Kevin are now involved as the third generation. We are a family-owned and managed auction and local real estate brokerage sales business based in Archbold, Ohio. 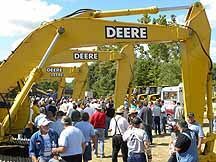 Frey & Sons is a firm that can handle multi-million dollar sales of heavy equipment, yet is flexible enough to service our home-town Northwest Ohio market with real estate brokerage services and auctions. We also offer equipment appraisal services to assist you in business planning. Robert G. Frey, president and chief auctioneer has been involved in the auction business his entire life, and graduated from Reppert’s Auction School in 1958. Frey & Sons have the knowledge and ability to handle any type of auction, whether it be in construction, industrial, transportation services, farm equipment, trucking or real estate. We handle small local sales, and large multiple-day, multi-million dollar auctions. Our services are tailored to fit each auction’s needs. We are known throughout the United States as a high quality, full service auction firm, and can give you the prompt, personalized attention you deserve. We are licensed in the state of Ohio, as well as other states. Frey and Sons would like to encourage you to explore our credibility, integrity and service records; we can provide references from past and current clients. We are confident that our past performance record will answer your concerns. If you have any questions, or how we can be of service to you, please feel free to contact us. 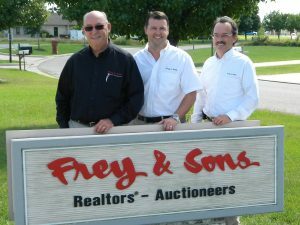 Frey & Sons is licensed as an auction company in Ohio and other states.